PTT is a highly concentrated micro-nutrient supplement for eliminating odour and reducing solids. PTT also contains a fragrance to provide an immediate response. The Ultra Fresh Super Strength portable toilet additive utilises advanced deodorant technology to provide long-term odour control. A convenient, non-staining drop-in sachet, it requires absolutely no direct skin-contact and disperses quickly in the waste tank. 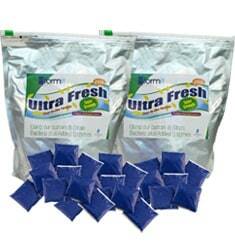 It comes in a resealable weatherproof bag of 48 units per bag, and comes in a fresh frangrance with long shelf-life. 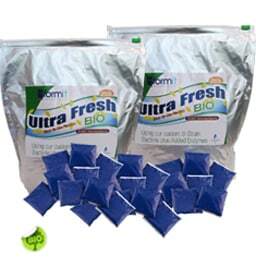 With their highly effective custom 8-strain bacteria plus added enzyme agents, Ultra Fresh Bio sachets not only deodorise your portable toilet waste tanks and septic tanks, but also break down waste and paper, to completely liquefy the waste tank contents. All without harming the environment! 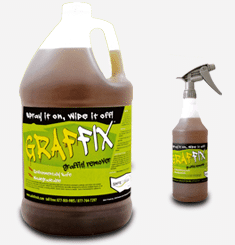 Graffix is an environmentally safe liquid gel used to remove paint and chemical resistant coatings, and does not contain MEK or any other harsh, flamable chemicals. It is specially designed to remove multiple layers of oil and latex paints from various materials, including HDPE, wood, brick, stone or metal. • For use on your toilet fleet, fences, walls and more! The Walex® Exodor® Supersize Deodorising Discs are designed with a fragrance that lasts for several weeks making portable toilets smell better for longer. Discs are concealed on the reverse side of the vent pipes on a plastic hook. 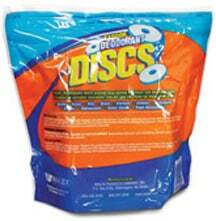 The Exodor® Supersize Deodorising Discs require 1 disc per month & are available in 100 disc packs, 5 packs per case. The Walex Hand Soap is an excellent fresh hand cleaning soap. 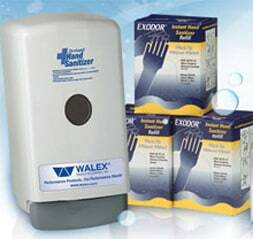 The convenient Walex Hand Soap Dispenser is easily attached to the inside of any portable toilet. Individual Dispenser and Soap available on request. The Hand Soap requires 2-4ml per use (200 – 400 uses) & is available in 800ml packs. 12 packs per case. The Dispensers are available in 12 units percase. All the above accessories & treatments are available at our premise at Acacia Ridge, Brisbane, Queensland. They can be used in chemical toilets or smaller portable toilets used for camping, in the caravan or on the boat. provide a one stop shop for all your needs. We supply quality Portable Amenities for commercial and domestic use to the Brisbane and Darwin metropolitan suburbs, regional districts and mining locations throughout Queensland and Northern Territory.